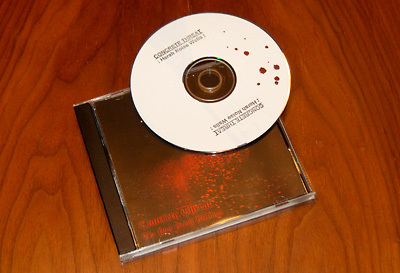 „The Pine Grove Killings – 2nd edition“ comes in a regular cd-case with a full-colour front- and backcover. Inside you find the cd-r with a white-label glued on top. Each copy of the release is handnumbered. I tried to research the background of the title, but I did not find any hint on „Pine Grove Killings“. If anybody knows about the concept (if there is one) feel free to e-mail me or use the comment-function at the bottom of the page. I have to admit that I had some problems to play the cd-r. I put it in my iMac and the disc started to spin, however, when I pressed play it did not start to play. I tried it in my second iMac and had the same problem. However, the MacPro at the office played the disc. I guess what caused the problem was the heavy quality of the label on the cd-r and the vertical-mounted slot-in-drives on the iMac’s. But let’s switch to the important thing which is the music. The disc houses a 40-minute piece of militant wallnoise. Based on a foundation of calm, rolling-type of deep-frequency rumbles the wall consists of an active, hectic texture of sizzling and buzzing mids and high-end-frequencies. The overall-feel of the wall is super active and energetic, which is a nice counterpoise to it’s monolithic and somehow monotonous structure. After about 10 minutes of steady flow a new sounds gets occasionally integrated into the wall. It is a grinding sound of feedback stabbing through, which is thrown into the mix from time to time. About 6 minutes later another sound is introduced, this time more scraping, but again it is not used as a constant texture but more as stabs of sound ripping through the wall. Towards the end of the piece the wall collapses nicely into buzzing sounds. „The Pine Grove Killings“ is a carefully constructed piece of wallnoise and perfectly executed. Though it is of quite an extensive runningtime the tension level is constantly high as is the power-level.